Blurb on the bottle: M is for Meerkats, and Malfunctioning Munitions. M is for Motueka hops and More Flavour. The first time this beer was brewed back in 2012, things didn’t quite go to plan, we were aiming for something quite different, but we loved the hop profile and the flavour came as a big surprise. Since that first batch, we’ve tweaked it a fair bit and unlike the munition, this beer is no dud. There is an, as-yet undefined hoppy impression that extends up over the top of the palate, a little like the ever curious but vigilante meerkat. The review: Um, what the heck are they on about? What’s this beer got to do with meerkats and malfunctioning munitions? I love this beer label’s design, but the blurb seems a wee bit muddled. A little like the beer itself. 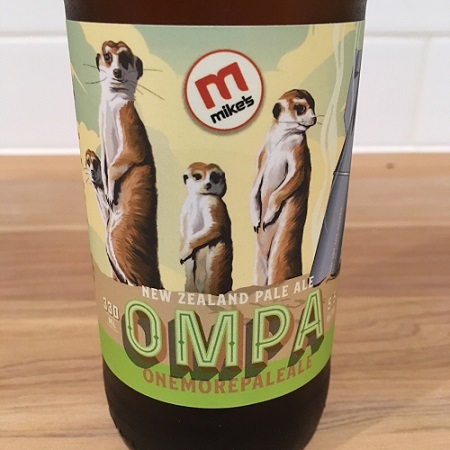 Mike’s OMPA (One More Pale Ale) New Zealand pale ale didn’t make a great first impression. It was milder than I was expecting, with a fruity, hop profile that I thought was surprisingly subtle for 5.5% ABV. It’s lightly bitter, sweetly malt, with medium carbonation. I drank it straight from the bottle, so I can’t comment on the colour of this beer, or accurately describe its aroma. The verdict: I’m sorry to say that Mike’s ‘One More Pale Ale’ should be called ‘Just Another Pale Ale’. It’s just a bit forgettable, really. I certainly hope the other beers in my Mike’s sampler box are better!